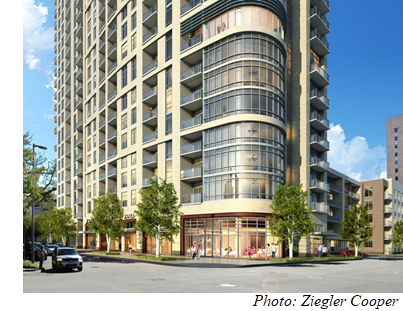 ​​​ HOUSTON – Camden Property Trust is moving forward on a downtown Houston apartment tower. The first phase of Camden Downtown will be a 21-story apartment tower featuring 271 units. The Class A tower will rise on part of a three-acre site bounded by La Branch, Bell, Austin, and Pease streets near the Toyota Center. The tower and its parking garage, at 1515 Austin, received building permits totaling more than $57 million in December 2017 and broke ground before the end of 2017. According to Ziegler Cooper Architects, the tower will be sited on the north end of the block in an east-west orientation.